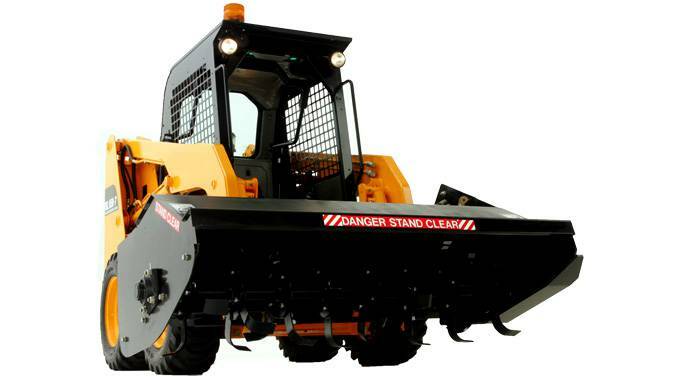 The Rotary Tiller is an attachment for ground preparation prior to turfing, planting, seeding. Dual rotation with bi-directional tynes. Two position offset mount that covers wheel/tracks and allows tight cut next to obstacles. Front edge is designed to level out uneven ground. Rear scarifier assembly significantly increases productivity by combining the tractive effort and force of the loader with hydraulic power of the tiller. High torque efficient chain system and high clearance hood to handle trash. For pricing or more information about the Rotary Tiller fill out the form and we&apos;ll be in touch soon. Alternatively call (08) 9457 1544.